grow in their Catholic faith together. 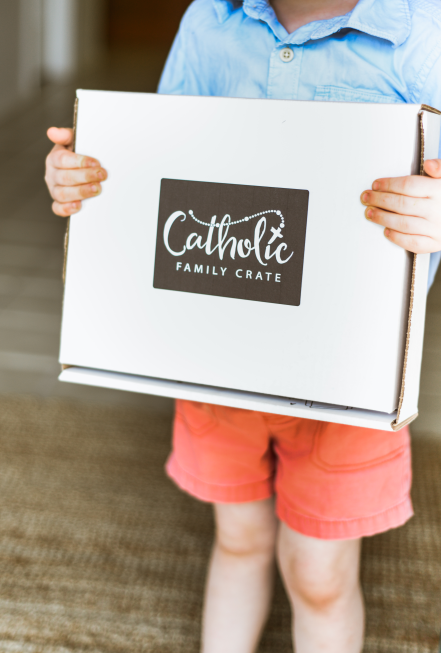 to help build a Catholic culture in homes. As a mother of young children, I was trying to find ways to bring the faith into our home, and although I had good intentions, I was just struggling to find the time to do it. If I found myself with spare time, I'd scour Pinterest and 'Catholic Mom Blogs' searching for ideas. In the end, I just felt terrible about myself. Why couldn't I be the perfect Pinterest mom or like the Catholic moms bloggers with seemingly endless amounts of time, money and creativity? So many of us long to live our beautiful faith more joyfully and vibrantly in our homes with our children, but aren't sure where to start. In my own personal struggle to celebrate the faith with my family, God put this idea on my heart. So I'm creating this for me. And for you. We provide your family with materials to help you teach, learn and grow in your faith as a family. AND you don't have to plan a thing. You don't have to go to the store. You just have to pick it up off your porch. and so goes the whole world in which we live."